Built in the treetops of Woodhill Forest, Tree Adventures is a series of obstacle courses each ending in a thrilling flying fox ride. 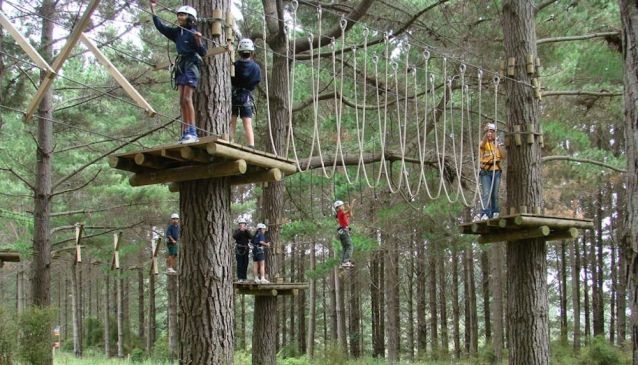 Set in tranquil forest just a short drive from Auckland, Tree Adventures is a great place to bond as a family, build some team spirit amongst work colleagues, or just challenge yourself in the fresh air. The attraction has a number of courses built from 3 metres to 14 metres above the ground. Courses are suitable for all ages and abilities from children and novice climbers through to proper adrenalin junkies. Picnic tables are available for visitors who want to make a day of their adventure and BBQs can be hired for a small fee. September 1 to May 31: 9.30am to 5.30pm daily. June 1 to August 31: 10:30am - 5:30pm daily.